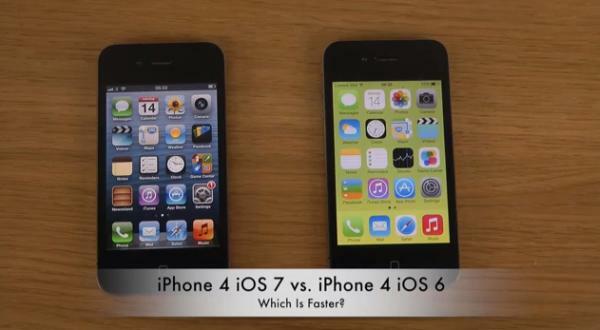 Since Apple released the latest version of its mobile operating system to the general public things haven’t exactly been running as smoothly as they would have hoped, but now we are looking at iOS 7 vs. iOS 6 in a speed test on the iPhone 4. Below this article we have a video that is just over three minutes long that is comparing the two versions of the iOS software on two examples of the iPhone 4. On one of the devices the home button is a little temperamental but eventually the reviewer manages to get the information to what apps are still open so they can be closed. One handset is running iOS 6.1 while the other is using iOS 7.0.2 and both devices are shut down, with the iOS 6 running device closing down the quickest. On rebooting both devices take a while but the iOS 6 touting device wakes up before the other model. The video unfortunately ends there but if using a variety of apps the handset could easily be affected even more running the new version of the software. iOS 7 has been beset with a number of problems since it was released by Apple that has seen issues from the likes of the iMessage service, and other apps keep on crashing. I hate os7. Never write reviews but I am not a fan. Battery does not last often have to reboot my phone and strange screens. Many more issues than ever before. Most of all bettery does not last over the calmest day of phone calls. FIX it APPLE!!!! !